Looks very nice to me! Sweet. Is that a fuel tank under the fuselage? It is there because of voracious fuel appetite the of the Goblin engine? No, it was a pod that housed up to eight machine guns for the ground attack role. Even better. I like things that blow up things. How long before someone makes a conversion kit to back-date it to the pusher prop version? Be easier to release the resin to smart up the old Heller one. 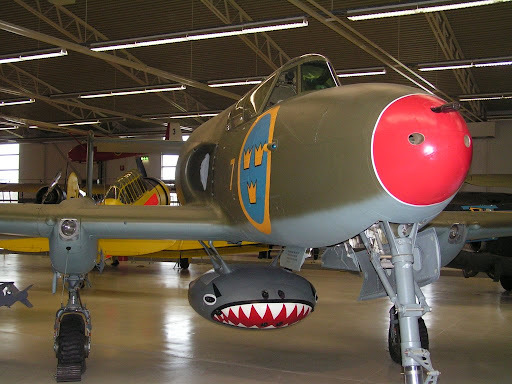 Heller's Saab J-21 is due for reissue this year Kit. Might get some more for the stash. That's good news, it's a lovely little kit and has loads of Whiff potential. There are three Heller J-21s and one Special Hobby J-21R for sale on Evil-bay. Amphion: Thanks for the picture. Still can't get my head round the trail bike tires.